Srinagar,Aug 08 (Agencies):The first of its kind night football tournament ‘Chinar Cup’ held by DPS Srinagar in corroboration with APS Srinagar was formally thrown open yesterday following an impressive ceremony at the school. History was made as two exciting matches were played under the lights, opening a glorious chapter in the sports history of state. 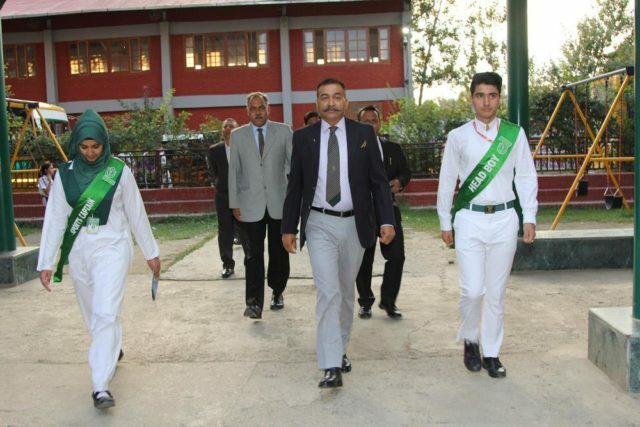 In the first fixture, DPS Srinagar squared against Sanctorum School Sopore. It was a one sided fixture which showcased the striking power of team DPS. One after another, six goals were scored by DPS while their defense kept Sanctorum from scoring. Goals were scored by Ayaan Sheikh in 20th minute, Musaib Javid in the 25th and 52nd minute, Kamil Wani in the 30th minute, Musaib Javid in the 42 minute and Hassan Darwesh in the 55th minute. In the other fixture, Green valley school defeated APS Srinagar by a solitary goal scored by Nehal in the 50th minute. The tournament is the first of its kind to be held in the country for school children. The school achieves the commendable distinction of being the first school in the entire country to have a fully lit school ground to allow play at night. The tournament features a total of 16 teams divided into two groups. Each team will play a team from its own group in a knockout format. Two matches will be played every day and the final of the tournament will be held on 16th September, 2018.